Panicum amarum.Larry Allain @ USDA-NRCS PLANTS Database (Accessed 5/214). 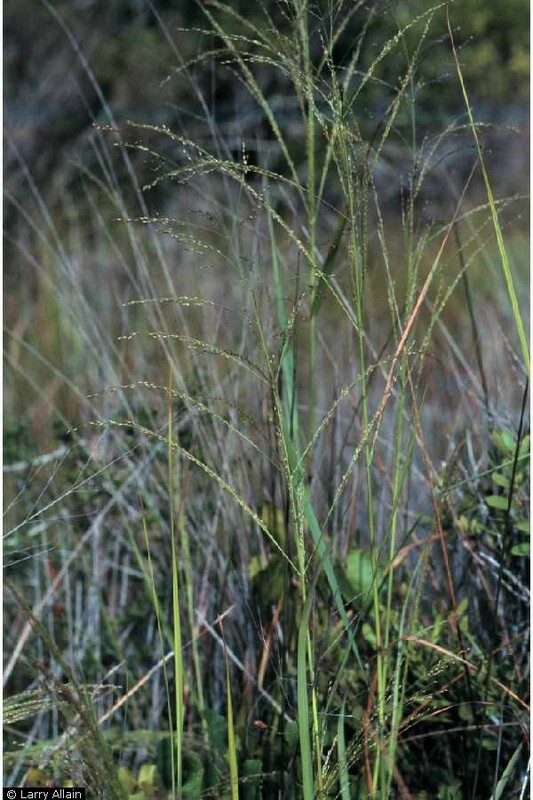 Panicum amarum is a perennial C4 grass (Aliscioni et al. ), stems 1-2 m tall, solitary or in small clusters, colonial from deep rhizomes, plants very waxy blue-green, ligule of dense white hairs up to about 0.3 cm long. Leaves alternate, elongate, to 50 cm long, 1 cm wide. Flowers dry, papery, spikelets 1-flowered, 0.5-0.7 cm, tip tapered; inflorescence 15-40 cm long, sparsely flowered, rather contracted, 1-2 short branches per node, secondary and tertiary branching common; blooming and fruiting July-Sept. Frequency in NYC: Rare: (NYS S3, U). Habitat: Sandy coastal areas, dunes, soil pH 5-7.5, tolerant of fire, drought, moderately tolerant of salt, intolerant of shade (USDA, NRCS 2010). Notes: Planted in grassland restorations.